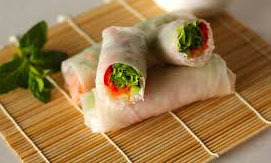 These vegetable rolls are riff on the traditional Vietnamese Summer roll. A study in simplicity, these rice paper rolls are filled with fresh julienned vegetables. The secret lies in the sauce: we dipped ours in a carrot, sesame oil and soy based dressing that brought the flavors to life. The best part? We’re torn between how healthy and low calorie they are, and the fact that nothing needed to be cooked. Twice the reason to try this unrecipe! Julienne a variety of vegetables, including cucumbers, carrots, diakon, red bell pepper, radishes and beets. Mix it up to suit your tastes. I used a mandolin, but depending on how many you are making, you can just cut them by hand. Be sure to peel the carrots, diakon and beets first! Dip a large rice paper wrapper* in warm water to soften. There is no need to soak them, just get them hydrated enough to be pliable. Place the rice paper on a work surface. Lay a small piece of lettuce and a fresh mint leaf or two at the bottom of disc. Layer on the julienned vegetables. Begin rolling the rice paper, tucking it tightly, but gently as you go. Roll it twice, fold the sides in, and continue rolling to the top. It should look like a fat, transparent egg roll. Lay the finished roll on plastic wrap. The rolls will stick together, so be sure to keep them from touching. Cover with plastic wrap and refrigerate until ready to eat. Peel about 3-4 medium carrots, and cut them into chunks. Place them in the food processor, along with a small shallot, peeled and quartered, a good sized chunk of peeled fresh ginger, about 1/4 cup of rice wine vinegar, a couple of tablespoons of soy sauce, about a 1/2 or 1 teaspoon of sesame oil. Puree until everything is finely diced and combined. With the machine running, add about 1/4 cup or so of vegetable oil ( We used grape seed oil, which has a neutral flavor. Do not use olive oil, as the flavor is too strong!) Add about 1/4 cup of water, and continue mixing until it forms a a chunky dressing. Check flavors, and add more vinegar, or soy sauce as needed. If the dressing is too thick, add a little bit more water. Refrigerate until ready to use. We served the rolls cut in half lengthwise, on a pool of drizzled dressing, and then put the rest on a platter with a bowl of sauce on the side. Sounds like the perfect dish to toss in my lunch bag tomorrow! *rice paper wrappers are sold packaged in the international foods section of grocery stores, or at Asian markets. As the weather gets warmer, I find my appetite changes. I long for lighter, cooler foods, utilizing the fresh tastes of the season.This simple side dish fills the bill, yet it is hearty enough to build a meal around. Tabbouleh, a Lebanese salad made of grains, herbs and tomatoes is a great make ahead dish, as it is best to allow the flavors to mingle a bit before serving. While it is traditionally made from bulgur or cracked wheat, quinoa, cous cous or even brown rice could be used in its place. It’s a perfect “unrecipe”that can be tailored to taste and dietary preferences. Prepare 1 cup of the grains as directed, being careful not to overcook them. Bulgur can be cooked on the stovetop for about 20 minutes, or soaked in very hot water until softened. Set aside to cool. In the meantime, chop a bunch of parsley and ½ a bunch of fresh mint leaves. Add a diced tomato or 2, and a large diced cucumber. A bit of finely chopped onion or scallions can also be added. Stir in the cooked grains. Toss with lemon juice, and olive oil. Season liberally with sea salt and pepper. Refrigerate for a few hours to allow the flavors to merge. Taste and add lemon juice or more salt and pepper if necessary. Enjoy! Note: Traditional tabbouleh is very heavy on the herbs, and uses the bulgur modify the balance to herbs and grains to suit your taste. This beautiful salad inspired by Mario Batali, is filled with springtime flavors, and hearty ingredients. 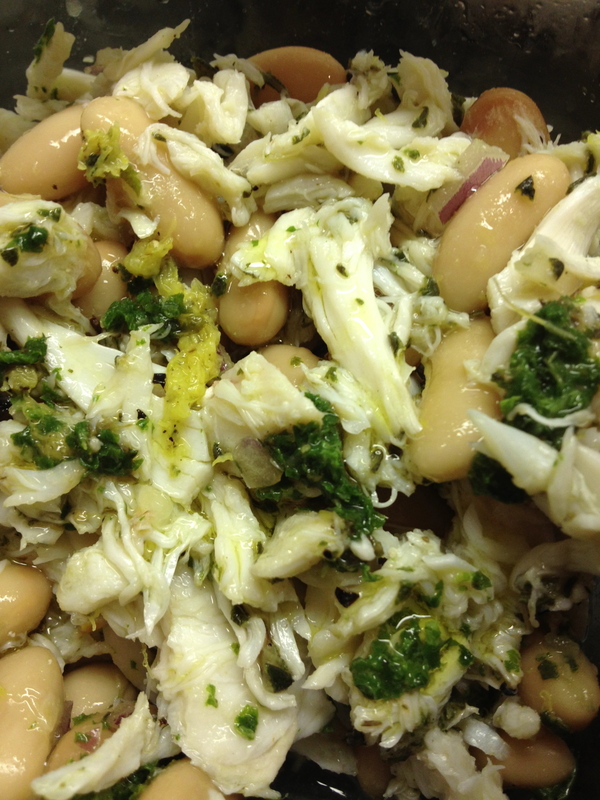 The white beans and crab make it filling enough to serve as a light main course, as well as a starter. Drain and rinse 1 can of cannellini beans and place in a bowl. Add some finely diced red onion, and about a teaspoon or so of diced fresh rosemary and marjoram. Add the zest and juice of a lemon, season liberally with salt and pepper and chill until ready to use. Before serving, mix in 1 pound of lump crabmeat, and drizzle with mint oil. Add a quick grind of fresh pepper and enjoy! Blanch about ½ cup of fresh mint leaves in boiling water for 15-30 seconds. Drain and squeeze dry. In a blender or food processor, puree the mint with ½ – ¾ cup of olive oil. This can also be done a couple of hours in advance and set aside until ready to serve. Follow us on Facebook, Pinterest, Tumblr and Twitter! With the heat index souring, it is important to stay hydrated. This spa water not only hits the spot, it also has natural properties to beat the bloat. Peppermint and ginger are both known to soothe the stomach and G.I. tract, while the lime adds a tangy shot of vitamin C. Cucumber helps flush excess water from our systems. While it seems counter-intuitive to drink water to rid your body of excess water, it actually works! Stay cool, stay hydrated and enjoy!!! Toss the ingredients into a pitcher, fill with water and refrigerate for a few hours or overnight. Strain before drinking. Are you looking for a healthy, tasty salad that packs a ton of flavor? Look no further. This Kale Salad has edamame and chickpeas for protein, and dried cranberries for a sweet touch. The zesty lemon dressing ties it all together beautifully. Cleaning the kale takes a bit of work, but one bunch yields a lot. 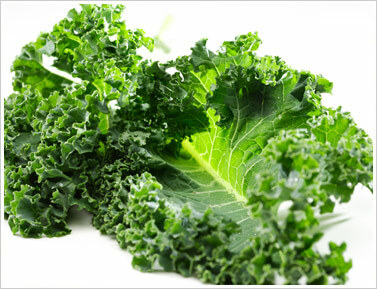 Cut the ribs out of a bunch of kale, and chiffonade* it into small, narrow pieces. Add a handful each of fresh mint leaves and fresh basil leaves, also chiffonade cut. Toss in about 1/2 cup each of chickpeas and steamed, shelled edamame. Add several cherry tomatoes, sliced in half, and a large handful of dried cranberries. Mix the juice of 1 lemon with several tablespoons of olive oil. Add salt, pepper, and about 1 teaspoon each of dried oregano and dried basil. Mix in a garlic clove that has been pressed but not chopped. Whisk the dressing well and allow it to sit to let the flavors develop. Toss the salad with the dressing and enjoy! *To chiffonade: stack the leaves on top of one another and roll them up. Slice the roll into thin pieces. Gently separate the strips. Watermelon is a great summer food. It’s low in calories, and high in re-hydrating water content. Here is a super easy and delicious salad using this refreshing fruit. While many recipes call for onions, olives and even tabasco sauce, we prefer to keep it simple and let the fresh flavors shine though! Mix in crumbled feta cheese and toss to blend. I love simple side dishes that pack lots of fresh seasonal flavors. This easy rice dish is enhanced with shallots, corn and the zing of fresh, aromatic mint. Sauté corn kernels (OK, big confession: I use frozen corn here. It’s still healthy and way easier than cutting the kernels off the cob!!!) and a few shallots, sliced very thin in butter until the corn is cooked. This should only take a few minutes at medium heat. Mix corn, shallots and rice together in a large serving bowl. Mix in chopped mint leaves.